L is for Labour...the hard sort! It is bulb planting time.....I planted 200+ on Saturday in various areas of the garden - front and back. As the nice weather continued on Sunday I decided to plant some in the front area, next to the road. If you look carefully at the photo above you can see the area I have actually weeded. 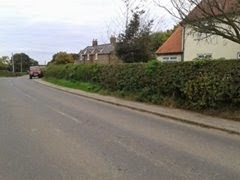 2 hours work and would you believe 50 bulbs are now planted between the telegraph pole and that particular spot. 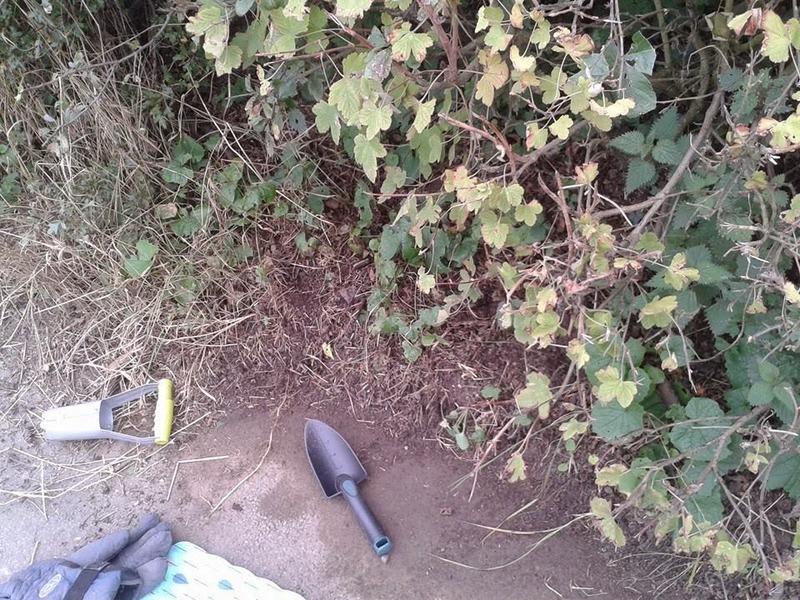 By working on the verge I cleared extra space on the pavement. Now I have the rest to do! Spring will be an exciting time! Thirteen stairs make up our staircase - I know this for a fact due to the countless times I have staggered down stairs with a box destined for the charity shop. 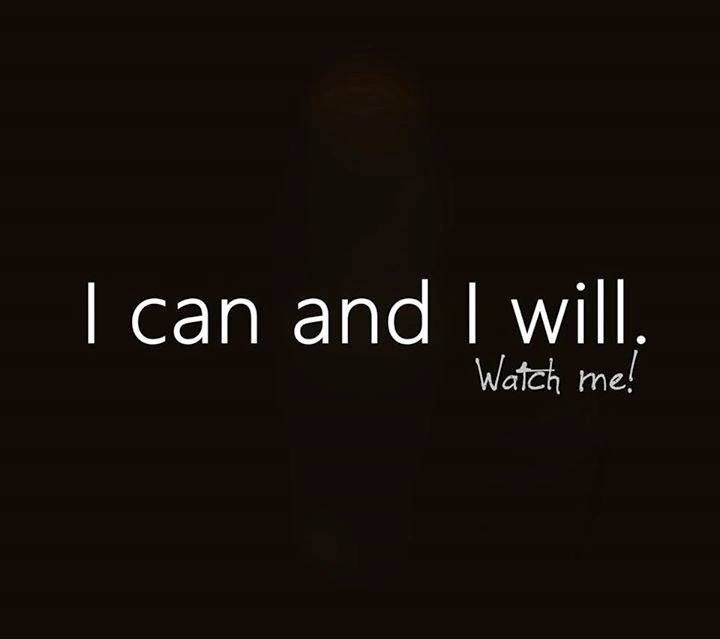 Yes I am on a mission and I am enjoying it all - very cathartic. The room is becoming emptier by the day, the charity shop is happy, my friends daughter is happy due to the boxes of crafty bits I pass over on a regular basis and I am happy. One slight change to plan - we are just concentrating on the one room now. Jon uses the 3rd bedroom as his office so the disruption that would be caused if we tried to clear two rooms in one go needs to be avoided. What will happen is once the room is cleared, stripped and plastered it will be left a week to dry. Jon will re-locate into it, allowing me to strip the 3rd bedroom and get the plasterer in. Once finished and dried out then we will decorate both rooms. The third bedroom has the access door to the loft......ahem! The loft needs emptying too! Watch this space - must get on! Kaleidoscope (noun) - a complex pattern of constantly changing colours and shapes. This week has seen the delivery of my spring bulbs. There are quite a few and I have plans for them all. 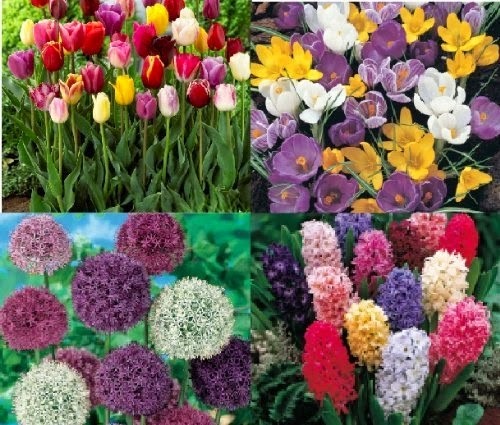 However I have received notification to say the bulb collection above will arrive later this week. Jon has enjoyed our time in the garden over the past few months so this collection is his project. He isn't going to tell me where he is going to plant them - he will avoid the area I have plans for - this is his project. Fun in the Nesbitt household don't you think? This is my K contribution for ABC in the Nesbitt garden. I think Autumn is definitely here - the amount of leaves in the garden would suggest so. The jobs I have planned this week are minimal yet essential. I have both plants and bulbs to plant, continuous sweeping then it's back to de-cluttering and clearing the 2 bedrooms. Plasterer is booked for October 27th so time is pressing. Lots to do! The view from the snug window from my previous post remains the same. We have had a drizzly foggy week. 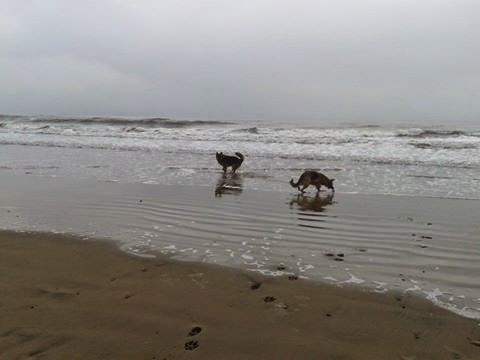 We go to the beach every morning and give the dogs a good hours run. 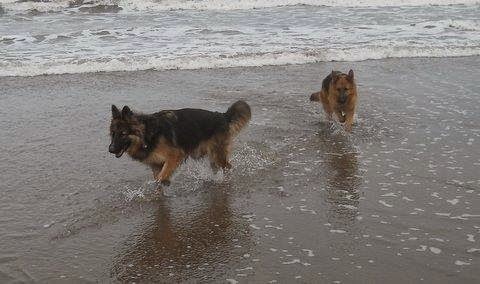 Bing loves the sea and Sadie is gaining more confidence paddling in the water. the summer clothes are now moved and the warmer jumpers etc. are now in their place. ready for our next project. The room needs to be cleared, stripped, plastered and decorated. store my craft and sewing materials - it will be an interesting project. It would be sensible to prepare the 3rd bedroom at the same time. 23 years ago, so we haven't rushed into it by any means. I already have the curtains for both rooms, underlay for the second bedroom so the colours are already sorted. I just need to get on with the de-cluttering. I am making up a lovely box of all crafty oddments for a friends daughter who loves to make things. Looking forward - it will be nice for everything to be done by Christmas. I will see the plasterer and get an idea of timing - then I will work out a timetable. Today was such a time - I am on it! Like a car bonnet so the saying goes! A couple of weeks ago I came across this simple bird ornament for £4.99. I have put it on the snug windowsill overlooking one of the bird feeding areas. Today the weather has changed and the thick fog following the rain is really awful, but sitting inside, keeping warm, watching the birds is a real joy. The current buzz words seem to be shabby chic - we call it junk. I have some of my shabby junk around the garden - waiting for some inspiring transformations. These will be part of my winter to do projects. The birds never took to this birdhouse so I found a purpose - will move it later in the season. In my greenhouse lurks a Jasmin awaiting a new home - label fell off so not sure which it is - fun when they flower then! Lots have been happening in the garden, but on a day like this there is only one place to be. I am wondering if it is time to think of autumn clothes....going from shorts and trainers to leggings and boots???? My J contribution for the ABC of the Nesbitt garden project! On entering our house Ivy greets you! In fact all over the wall! Whilst this ivy looks quite old and established......you don't have to look far to find new growth. At the bottom of the garden, where I took you last week Ivy grows in abundance. When I re-positioning two of the chimney pots guess what I chose to put in it? 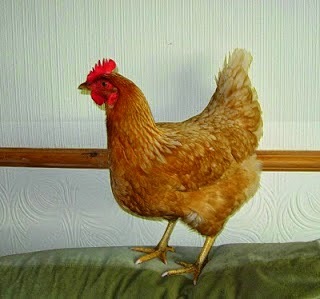 Bev on the other hand was heading for the henhouse to lay an egg! There was once when Eva made her way INSIDE our house! I was very quick to IMPLY it was not appropriate for her to sit on the settee! Please join us for an Afternoon Tea Party, to help raise funds for Cancer Research on Saturday 6th September at Liverton Village Hall between 2pm & 5pm. Cherrytree Accessories will display a beautiful range of affordable ladies clothing, scarves & jewellery - all of which will be available to purchase and take home with you on the day. All commission donated to Cancer Research. On Saturday I organised a bit of an event for Cancer Research. It was a great afternoon. For some time I have been a fan of Cherrytree Accessories so after speaking with Catherine we decided to have a clothes party. £200 was raised and we plan to have another afternoon in the Spring - it will be a good excuse to have a cup of tea and look at some fabulous clothes. One item which was very popular was the fleece lined leggings. I have a couple of pair and find them so warm and comfortable in the cold days to come - and there is definitely a nip in the air! My neighbour works part time and when she works I let the dogs out for the necessary. On Sunday Gem gave birth to 4 puppies. One girl and 3 boys! I am blogging once a week at the moment - believe me the other days are spent working very hard in the garden, housework and Jon's business. Today however the weather is cooler and whilst we are expecting it to be sunny later at least it gives me time to catch up on what's been happening. In our back garden we have a shrubbery which we have added to since moving here. It's home to an old crab apple tree and various shrubs, roses and flowers. I am looking at changing this somewhat, but at the moment it's okay...ish. One of my favourite shrubs is the Hydrangea - the large established one on the right was here when we moved in. These two new mopcap ones were a bargain at £7.50 each at B&Q. Like many garden centres bargains are in abundance right now - can't wait to see them develop over the next few years. Is another large area of the garden - my favourite part to be honest. The established plum trees, originally part of the orchard on the village green (where our house was eventually built) line the stream which runs through the bottom of our land. I have spent many days clearing, weeding and thinning out this area. Still a way to go but I must admit I do find weeding quite rewarding. Pulling the nettles - feeling the roots popping across the garden and eventually coming out in a huge clump! The stings are an added pleasure - NOT! It comes back to us not using any chemical weedkillers due to the hens. Whilst they are suitable to use where pets are brushing amongst them - it is quite a different matter when the hens EAT the weeds etc, digest them and then produce eggs which we eat. To prove my point - along came Bev to find some grubs for a quick snack! In the background is another area of weeds which I am working on - this is the bottom area of the paddock and whilst it is on a slope we need to have it cleared. There is also another dry stone wall. 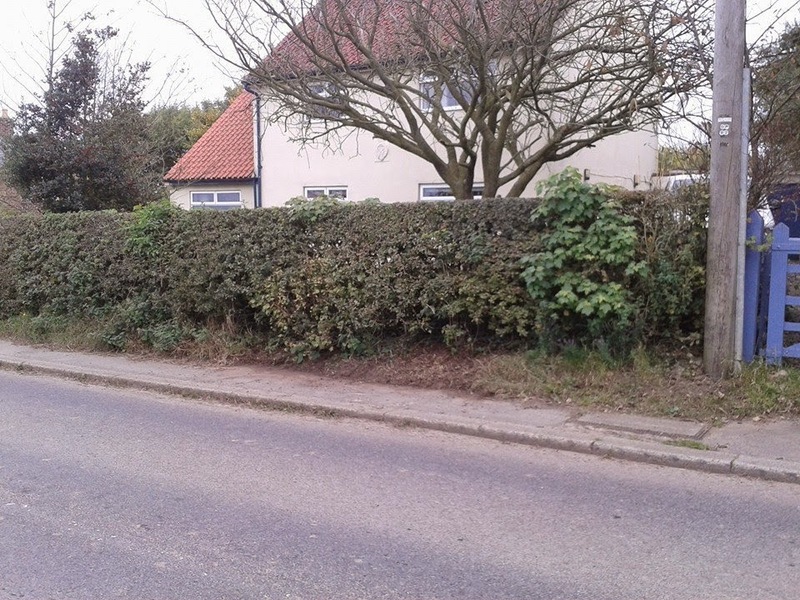 Again this was overgrown when we moved here and I spent one summer digging out the huge clumps of grass and earth. As I was weeding away I could hear a scratting sound - looking through the greenery I saw Eva enjoying a paddle in the stream, catching treats from the surface of the water. Wherever I work in the garden a HEN always seems to be close by! So onwards and upwards...lots to be getting on with. Week H in my garden challenge - I am getting there!